A good reel mower not only saves the user money because they no longer have to buy oil, gas and air filters on a regular basis but also helps save the environment. And that’s why so many people are looking for, and buying, the best reel mower they can buy. These lawn tools are an investment that continues to pay off for the homeowner, as well as the environment, year after year. Before a homeowner can reap all of the benefits afforded by these push mowers, however, they have to do their homework and find the best reel mower possible. One that will make yard work simple. To help these people out, I’ve selected ten of the best models currently available. Models that will do a good job of cutting the grass. This mower has quite a few features which make it a useful yard tool to keep around the house. 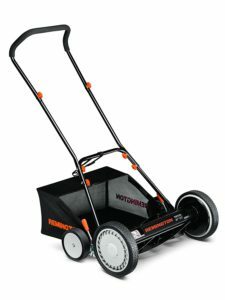 It has a 16-inch cutting path that makes short work of lawns and can be used with a rear bag to collect the clippings or can be used for mulching the grass. This tool provides up to 4-different height adjustments that allow homeowners to set the height from 1-1/8th-inch to 2-1/4th-inch, so they can customize their grass cutting experience. This model also has 10-inch front wheels and 2-inch rear rollers that make it easy to push over a variety of different lawns. This classic push lawn mower has a number of features which make it the ideal solution for tough to cut lawns. For example, this 20-inch mower has 9 grass heights to choose from and can be adjusted from 1-inch to 3-inch cuts using quick-snap adjusters. This model also has 10-inch dual-tracking wheels and radial tires that allow it to easily move over grass without breaking the user’s back. Other features found on this yard tool include 5 steel blades that have been heat-treated and quickly cut through grass without bruising it and a ball-bearing reel. This durable mower is for homeowners who don’t want to spend a fortune on a grass cutting tool but still wants a model that’s durable and will get the job done. This model has an 18-inch cutting path that makes it great for light to medium yard work and has a 5-blade adjustable reel that easily cuts through grass. This unit can be used to either mulch the grass or fitted with a bag to collect the clippings and it has an adjustable cutting height that can be set from 0.75-inch to 2.5-inches. All of the features make this mower an environmentally friendly tool that gets the job of lawn cutting done. This manual mower makes short work of grass cutting and does so without polluting the environment. This 20-inch mower is just the right sized for smaller lawns and can be set to 1 of 9 different heights to cut the grass to the exact height needed. 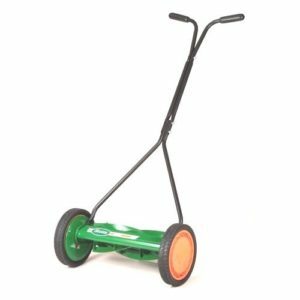 It has two 10-inch wheels and two 6-inch wheels that give this tool the ability to quickly navigate over just about any lawn. It also has a 6.6-gallon grass catcher that attaches and detaches easily, depending on whether they want to use this mower to mulch the grass or to bag it. Which makes this maintenance-free mower ideal for someone who doesn’t want to fuss over the lawn cutting duties. This cylinder mower is a combination of power, precision, and efficiency and does a good job at cutting bent grasses such as St. Augustine, Bermuda or Zoysia grasses. Unlike rotary mowers which tend to hack or bruise blades of grass, this mower gently snips them instead and improves the look of the lawn. It features a 7-blade reel with ball bearings that provide a 16-inch cutting width that makes short work of grass cutting. It also has a reel and bed knife blade made from tempered alloy steel and its height can be adjusted from 1/2-inch to up to 2.5-inches. Equipped with a number of exciting features which make it useful to just about anyone who wants a beautiful lawn, this lawn mower is sure to be a welcome addition to any tool storage shed. It cuts a 16-inch wide path and can be adjusted from 1/2-inch to 2.5-inches, so homeowners can not only get their lawn care duties finished quickly but can also cut it according to their preferences. This mower also has a T-style handle that has cushioned grips which make it easy on the user’s hands as they do their yard work and has 10-inch wheels that can easily maneuver just about any lawn. This easy-to-use and very efficient mower has a number of features which make it a good choice for anyone who wants to get their grass cutting done quickly. This mower is not only quiet due to its non-contact blades, but is also easy to push and steer thanks to its large 10-inch wheels. Users can adjust it to cut at a variety of different cutting heights and has a ground bottom blade that makes for a very precise cut. It also has a handle that can be taken apart, so it can be put into a car or trailer or stored away for the season in a shed. Reliability, power, and convenience can all be found in this 4-blade mower. It cuts a 14-inch wide path through the grass and is ideal for small yards or for cleaning up problem areas left by a larger mower. It has a tempered alloy steel reel that cuts with scissor-like precision against the bed knife blade. It has 8.5-inch diameter polymer wheels that are durable and allow for easy turning, and this mower is adjustable from 1/2-inch to 1.75-inch cutting height. And since this mower only weighs 19-pounds, it’s light and easy to use, even on a regular basis. Lightweight and designed for smaller yards, this manual lawnmower has many of the features that lawn cutting enthusiasts look in a grass cutting tool. It cuts a 14-inch wide path through the grass and is easy to turn thanks to its 10-inch composite wheels. The height at which it cuts grass can be adjusted from 1-inch to 1.75-inches and its heat-treated blades are designed to stay sharper for longer periods of time. And since it has a zinc plated handle that’s corrosion resistant and covered with plastic grips, this mower is designed to give the user many seasons of lawn cutting. With an innovative design that makes it thirty percent easier to push and with fifty percent more power than many comparable non-powered mowers, this Fiskars mower is sure to be a pleasant surprise for homeowners who use it. It has a 17-inch cutting path and an Inertia Drive reel that allows it to power through tough grasses and weeds and get the grass cutting done quickly. And its Stay Sharp Cutting System is designed in such a way that it cuts the grass without the blades coming into contact with one another and thereby reducing friction and blade wear.